The South African prop, who is Irish qualified, is believed to be moving from the English Premiership side to join the Irish Province this summer. The 26-year-old can play either side of the front row, although he may prefer the tighhead option. 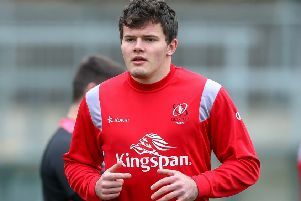 Milasinovich would be seen as a back-up to the current crop of props in Ulster and also replace the probably departing fellow South African Weihahn Herbst following recent speculation he would be returning home after this season. Milasinovich will certainly have heard much about Ulster as Neil Doak and Alan Solomons, who both coached at the Irish Province previously are on the coaching ticket at the English Premiership side. The recent announcement that Connacht prop, Conor Carey is moving to Worcester next season would indicate the club are losing a front row option. Weighing in at 131kg, Milasinovich joined Warriors Academy in the summer of 2015 from the University of Johannesburg in South Africa where he played Varsity Cup rugby. He made his senior debut in 2015/16 but successive injuries ruled him out for a year before he returned to playing and was ever-present in the side last season making 28 appearances and 16 already this season.